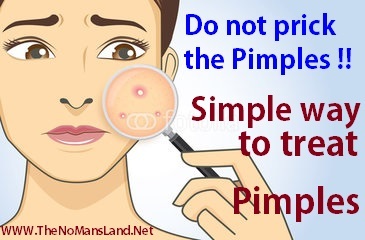 Do not prick the pimples !! 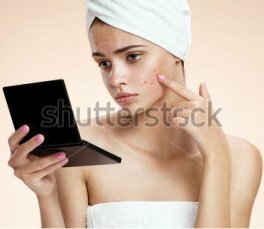 The excessive oil trapped in the pores causes a Pimple. There are many reasons for pimples and many ways to treat them easily. You can terminate the pimples in our traditional way. Normally between 12 years to 30 years, both male and female get the pimples. During the puberty, age females will get more pimples, due to the Harmon and physiological changes. Sometimes due to over stress also, you may get pimples on the face. Unhygienic way, travelling more in sun and dust are few reasons to get pimples. The pimples generally occur on the face, shoulders, back and neck. Apply Ice cubes on the pimple and swollen skin, the ice cubes quickly reduces the swelling and reddishness. The Ice cubes help to improve the blood circulation, tighten the pores, remove the oil and dust from the skin. After giving ice treatment, you can apply white toothpaste on pimple and surrounding. 2. Fresh lemon juice: clean the pimple and surroundings with cotton and apply fresh lemon juice, allow drying. Three times a day will clear the pimples. You can add cinnamon powder and lemon juice and apply on pimples before going to bed in the night and wash with warm water. You will get a spotless face. 3. Steam wash: take a wider container with boiling water, and allow steam to get contact your face. Three times and 15 minutes of steam wash will remove oil, dust and bacteria from the skin and cure a pimple easily. 4. Garlic – multi-skill medicine – Antioxidant, anti fungal, antiviral and antiseptic medicinal Onion Genus is the best medicine. Apply juice of garlic on the pimple and surroundings. Three to five times in a day will make a spotless face. Remember to wash your face with warm water each time. 5. The natural antibiotic – Honey is not only sweet but best medicine for many things. For a pimple, first clean the pimple and surroundings with clean cotton and apply honey. After 30 minutes wash with warm water, three times in a day, the pimple will stay away. You can add cinnamon with honey, make a paste and apply on the face before going to bed. Next day morning wash with warm water. You will get back your sweet face. 6. The rich vitamin A, C, and E with potassium cucumber is a soothing and cooling vegetable. Apply cucumber ground paste on the face and wash with warm water after half an hour. The cucumber enriches your skin. 7. Papaya – the antioxidant with vitamin A rich Papaya fruit is another way for pimple treatment. The papaya juice with honey is one of the best combinations for silky skin and pimples. Apply the juice on the face before going to bed and wash with warm water next day. You will get smooth and wrinkle free face.